My grandmother Emma Buckingham kept a couple of letters that I (prompted by my mother) wrote to her in 1953. 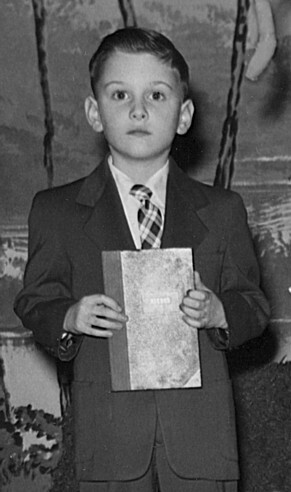 JUST BACK HOME FROM KINDERGARTEN. 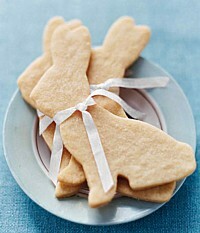 OH, YOU MADE JUST ENOUGH COOKIES. THERE WAS ONLY THREE LEFT!  HEY  MOTHER THOUGHT THAT THERE WAS GOING TO BE MORE LEFT. AND THE THREE WERE BUNNIES. In my kindergarten class, we were preparing an operetta to be presented on April 17 on the big stage in the high school auditorium. 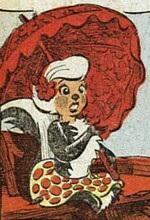 The teacher, Georgia Cramer, had decided that since I had learned to read I should demonstrate that skill, rather than simply portraying a nursery-rhyme character like everyone else. I would be the Secretary. Unsure how to spell that word, in my letter I resorted to an abbreviation. FOR THE OPERETTA, INSTEAD OF MY PART, IM A SECY. THAT MEANS THAT I READ THE CHARACTERS NAMES OFF. AND SHE WANTS ME TO WEAR MY NEW SUIT, SHIRT AND BOW TIE. THE TAILOR WILL HAVE IT READY TO WEAR SUNDAY. ALL HE HAS TO DO IS SHORTEN THE PANTS AND TAKE ONE INCH OFF ONE SLEEVE. P.S. SNOW IS ALL GONE. I somehow managed to avoid wearing the bow tie. I may still have this red plaid one in a drawer somewhere. The teacher wrote my script, including a Roll Call listing 22 characters and groups to be introduced. My fathers bookkeeper typed the text and put it in a ledger book for me. It originally placed the scene at the Convention Hall. Perhaps that detail was suggested by the Republican and Democratic National Conventions televised the previous July from Chicago. However, at the was replaced by on the lawn of because our stage backdrop depicted not a meeting hall but a sunny wooded lakeside. The 1952 annual Convention of the Children of Mother Goose met in the House That Jack Built in the land of Make Believe. Place of the 1953 Convention to be in Toytown at the on the lawn of Convention Hall, the date to be April 17, 1953. The convention closed in order. Doctor who, now? 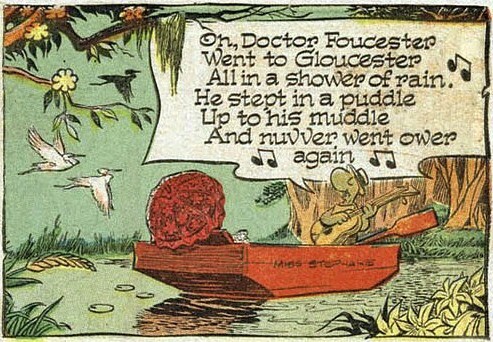 I didn't know it at the time, but it turns out that Doctor Foster is himself a nursery-rhyme character, better known in England than here in America. His little poem works better if you use the native pronunciations I've added in brackets. And never went there again [agayne]. It's claimed that this rhyme is useful in teaching children the valuable lesson that one ought to mind where one steps, lest a piddle prove to be deeper than it appears. Pogo, May 10, 1970. Churchy serenades Miss Mamselle with my character's story, but she's less than thrilled. That summer, I wrote my grandmother again to let her know we had safely arrived home from her place. However, we had interrupted our 120-mile journey with a dinner break 18 miles short of our destination, so that when we reached the house Mother didnt have to cook. WE GOT HOME ALL RIGHT. WE ALSO STOPPED AT BUNS RESTAURANT, DELAWARE. WE HAD CORN-ON-THE-COB, CHICKEN & MASHED POTATOES. ALSO ICE CREAM & WATERMELON. JOHN T. SEAMANDS FROM S. INDIA, AT FIRST METHODIST CHURCH (WEDNESDAY), GAVE US A NINE-INCH LION. 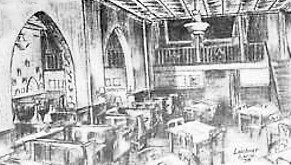 Buns (at right) is a landmark restaurant thats been in business in Delaware, Ohio, since 1864. The lion, as I recall, was actually a carving of a sleek prowling black panther on a wooden base. My uncle Jim, Emmas son, was now working for my father. His wife Virginia had been limping recently. I SUPPOSE YOU WANT TO KNOW ABOUT VIRGINIAS LEG. WELL! ITS ALLLLLLLL RIGHT NOW. ITS AWFULLY HOT TODAY. BYE.